Thanks to Mr. Jonathan Schiefer for sitting down with me. Oh, and Lou, sorry about getting your title wrong. 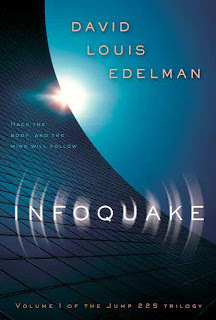 io9 has announced that their bookclub selection for April will be David Louis Edelman's Infoquake , the first volume of his acclaimed Jump 225 trilogy. 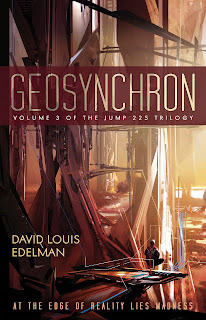 Here is their review of the third and final volume, the recently released Geosynchron. Fantasy Book Critic said of Geosynchon that it "plays on the level of the masters of modern sf like A. Reynolds and PF Hamilton," and was "so far the best core-sf novel I've read in 2010." SFFWorld agreed and said, "The Jump 225 Trilogy is a must read, an instant classic, and a work of SF that will help define this first decade of the 21st Century and could cast a long shadow for many years to come." Meanwhile, Locus said of the whole trilogy that, "This smart, idiosyncratic blend of cyberpunk, libertarian entrepreneurship, and social engineering will, I think, stand as a seminal work of 21st century SF." Just a few of the many enthusiastic reviews that are coming in. Greg L Johnson's Best of 2009 at SFSite includes Ian McDonald's Cyberabad Days (#8), Kay Kenyon's City Without End (#5) and Paul McAuley's The Quiet War (#3). Very proud of all our authors, and proud that Pyr has three books among this top ten list. Driven by the ghosts of the Darakyon, Achaeos has tracked the stolen Shadow Box to the marsh-town of Jerez, but he has only days before the magical box is lost to him forever. Meanwhile, the forces of the Empire are mustering over winter for their great offensive, gathering their soldiers and perfecting their new weapons. Stenwold and his followers have only a short time to gather what allies they can before the Wasp armies march again, conquering everything in their path. If they cannot throw back the Wasps this spring then the imperial black-and-gold flag will fly over every city in the Lowlands before the year's end. In Jerez begins a fierce struggle over the Shadow Box, as lake creatures, secret police and renegade magicians compete to take possession. If it falls into the hands of the Wasp Emperor, however, then no amount of fighting will suffice to save the world from his relentless ambition. Amherst, NY -- To celebrate their 5th anniversary, Pyr, the science fiction and fantasy imprint of Prometheus Books, will sponsor a contest that incorporates things they hold dear: creative and powerful writing, a passion for reading genre fiction, and this year’s special number, five. For their Pyr and Dragons Adventure 5th Anniversary Contest, Pyr invites readers and fans to submit a short essay on the theme: Five reasons why science fiction and fantasy is important to you. - Entrants must reside in the Continental United States and be at least 21 years of age. - Essays must be no longer than 1500 words. - The body of the submission email must clearly identify the entrant’s full name, address (within the Continental United States), phone number and email address. - All submissions must be received between April 1, 2010 and June 1, 2010. *For complete list of rules and regulations see http://www.pyrsf.com/. All eligible essays will be read and reviewed by publishing staff at Prometheus Books. Not all of these preliminary readers will be science fiction and fantasy fans, so outstanding essays will likely be those that pique their interest in the genre and make them want to read it too. The top twenty-five essays as determined by these industry professionals will be read by Pyr Editorial Director Lou Anders, who will select the top three. The writer of the Third Place essay will win a commemorative Pyr 5th anniversary keepsake and five complimentary books of their choice from the Pyr catalog. The writer of the Second Place essay will win a complete set of Pyr books as published by the contest end date of June 1, 2010 (one copy of each title, without duplicating those that appear in more than one binding) and a commemorative Pyr 5th anniversary keepsake. - A round-trip flight to Atlanta, GA during Dragon*Con, one of the largest multi-media, popular culture conventions focusing on science fiction and fantasy, gaming, comics, literature, art, music, and film in the US. Dragon*Con 2010 will be held September 3 - 6, 2010 (Labor Day weekend). - Two nights hotel accommodation in Atlanta, GA, Sept. 3 and 4, 2010. - Dinner with Special Pyr Author Guests and Pyr Editorial Director Lou Anders—details to be announced! The grand prize winning essay will be posted at the Pyr-o-mania blog, and may be promoted by the publisher by other means, including but not limited to their other blogs, websites, e-newsletters and social networking pages. With an emphasis on quality, Pyr helped to introduce readers to some authors then little-known in the U.S., such as John Meaney, Ian McDonald, Joel Shepherd, Justina Robson, and Joe Abercrombie. Pyr has also published such established authors as Mike Resnick, Robert Silverberg and Michael Moorcock. Pyr Editorial Director Lou Anders has been nominated for the Hugo Award for Best Editor Long Form for three consecutive years. In 2009, Prometheus Books and Pyr launched a major e-book initiative, with titles available on Kindle and programs with many different e-reader platforms in the works. In 2010, in addition to celebrating its five-year anniversary, Pyr will publish its 100th title. 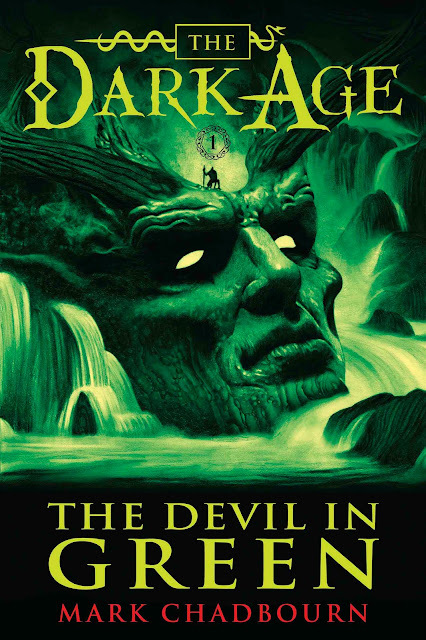 After the Age of Misrule comes the Dark Age! Humanity has emerged, blinking, from the Age of Misrule into a world substantially changed: cities lie devasted, communications are limited, anarchy rages across the land. Society has been thrown into a new Dark Age where superstition holds sway. The Tuatha De Danaan roam the land once more, their terrible powers dwarfing anything mortals have to offer. And in their wake come all the creatures of myth and legend, no longer confined to the shadows. Paul McAuley has placed twice in SF Site's Best SF and Fantasy Books of 2009: Readers' Choice Poll, with Gardens of the Sun at #10 and The Quiet War at # 6. Both books are tied with other works (Cory Doctorow's Makers and Adam Roberts' Yellow Blue Tibia respectively). Congratulations to all the authors selected! "Fans of the series will not be disappointed. ...The union of hard science and good story telling is one that harkens back to such greats as Arthur C. Clarke or Asimov.... We fully recommend Gardens of the Sun as a first rate space opera that melds science, politics and fast paced action. A worthy sequel of this series could easily span those hinted future millennia much like Olaf Stapledon’s The Last and First Men or the Dune franchise… be sure to get in on the The Quiet War saga from the ground floor!" "Read it. Right now. ....Fans of the current crop of UK fantasy authors like Abercrombie, Barclay, Erikson, Ruckley & Lloyd. This book has the same sorta feel as most of those books. This procession of Pyr books from many of the UK authors listed above is converting me into a big fan of the UK fantasy scene. ...One of my favorite reads so far this year. I would say that it is likely a top 10 2010 read for me, except for the fact that there are 3 more books coming out in the US this year. I have a feeling that as this series gathers steam, the later books are going to be even better. So books 2-4 have moved near the top of my "must reads in 2010" pile. For fans of epic fantasy, there is quite a lot to like here." 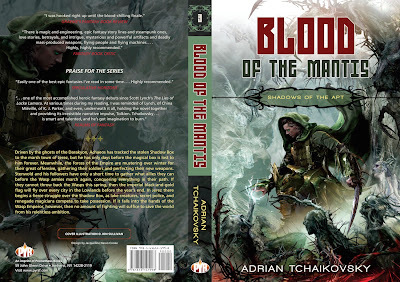 "British fantasy writer Adrian Tchaikovsky has created a very deep world in Empire in Black and Gold, the first novel in his Shadows of the Apt series. 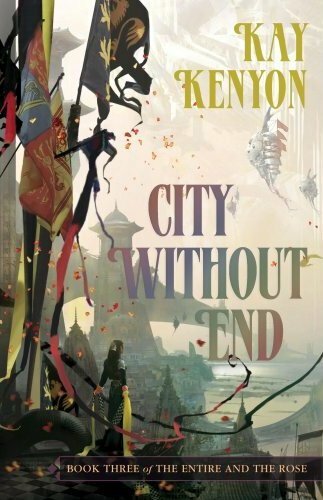 Striding the line between high fantasy and steampunk sf, he carefully builds a society equal parts politics, emerging technology, and leftover ancestral magic. Drawing on classic fantasy themes – quest, growth, old ways versus new – and throwing in more modern themes of class and ethnic conflict, Tchaikovsky creates a complex web of character and action that pulls you relentlessly to the end. ... The depth of the world Tchaikovsky creates is stunning." "It felt like the first two books in Edelman's Jump 225 series had twisted reality about as far as it could go. 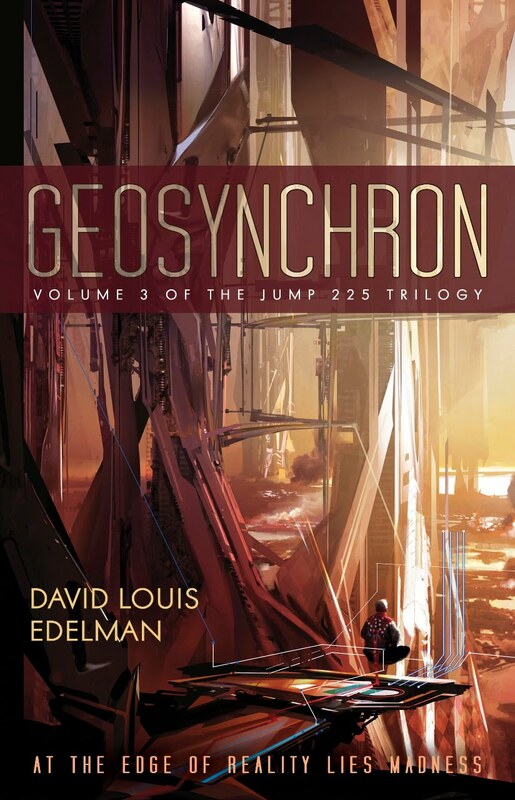 However, with the last book in the trilogy, Geosynchron, we realize we were only peeking into the rabbit hole before. Now we get a swift kick that sends us tumbling all the way to the bottom."